To cut a swell in the army. For I’m their pet in the army. I wasn’t cut out for the army. And that won’t do for the army. Sheep’s eyes at me in the army. Laura Ingalls Wilder seems to have been very taken with this song; she cites it three times (Little House in the Big Woods, chapter 7, supposedly dating from 1872; On the Banks of Plum Creek, on the next to last page, and By the Shores of Silver Lake, chapter 15, from 1879). If her recollection is accurate — and it should be recalled that she wrote sixty years after the event — the song became popular in her family very early in its existence, because the earliest dated sheet music, by J. L. Peters, was dated 1868. A roughly contemporary but undated sheet music publication by Lee & Walker credits it to T. Maclagan, but the history of the song is not really known. It is by no means clear that Laura actually knew it in Minnesota. The song has gone into tradition, but it has not to my knowledge been collected in the Midwest. Vance Randolph, however, picked up two versions (one a playparty) in the Ozarks, near where Laura spent her later years. So the possibility must be admitted that she learned it there and retrojected it into her midwestern years. Still, it was probably heard in Minnesota parlors at one time or another, so we might as well include it. The version here is based on the version printed on pp. 47-48 of Sigmund Spaeth’s Weep Some More, My Lady, with the punctuation modernized. Spaeth’s text also includes interjections that might be spoken between the verse and chorus, but I have omitted them; they’re pretty feeble. It is interesting to note that Laura’s version does not quite match the sheet music version; she has “folk processed” it somewhat. 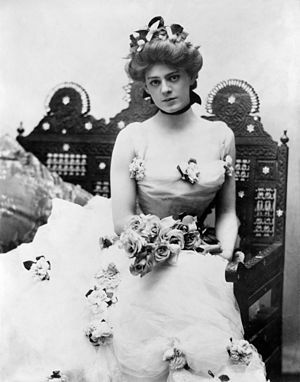 Spaeth notes that the song was used in a play of the same name, in which Ethel Barrymore made her debut.